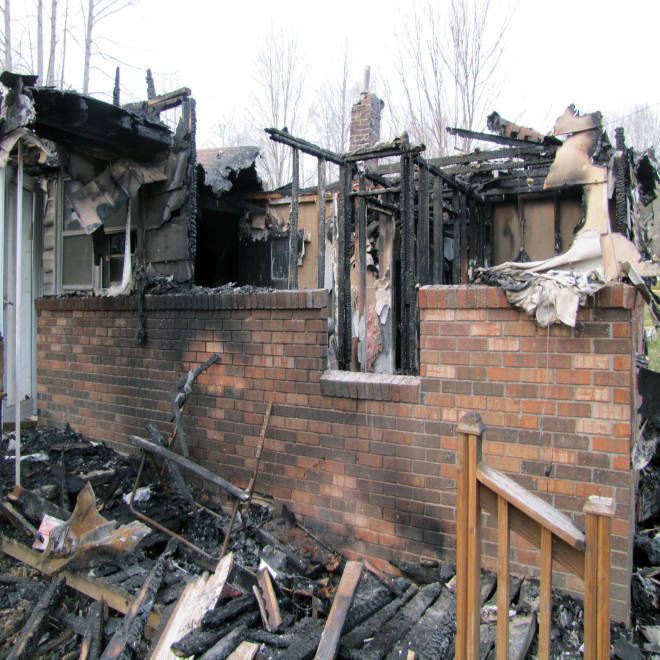 The charred remains of a home after a fire erupted, Saturday in Gray, Ky., killing two adults and five children. Five young children, a pregnant woman and her boyfriend died in a house fire Saturday morning in southeastern Kentucky. Police received a call around 10 a.m. regarding a fire in the Gray community of Knox County. Tracy Turner, spokesman for the Kentucky State Police, told NBC News that the names of the deceased have not been released and that officers at the scene are still working to investigate the cause of the blaze. Police told NBC affiliate WLEX-TV they don't believe foul play was involved. Flames were extinguished by 12:30. Knox County Coroner Mike Blevins told The Associated Press the deceased are a man, his girlfriend and five children. The woman was the mother of three of the children, aged 3, 2 and 1, while the other two kids were sleeping over. Relatives told WLEX the woman was a few months pregnant. All seven died of smoke inhalation.